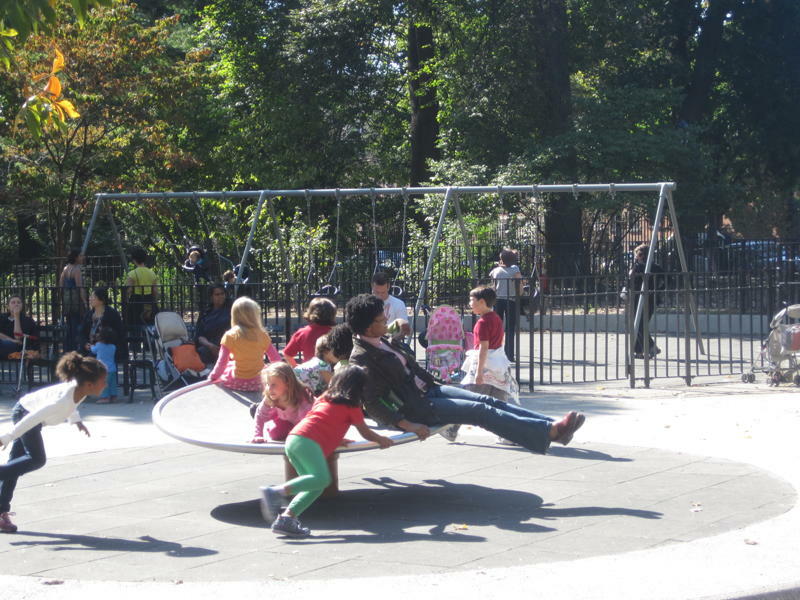 It took a long time, but the renovation of Vanderbilt Street Playground in Windsor Terrace is finally complete! 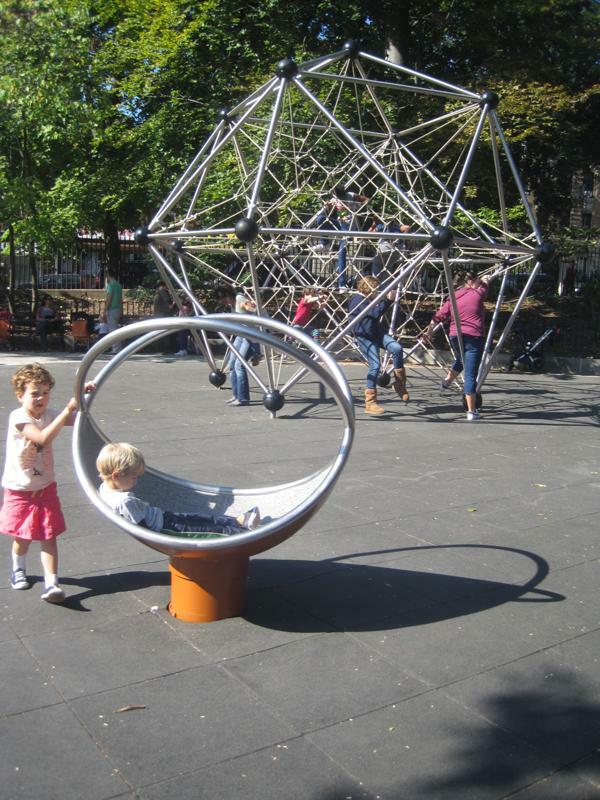 Before the renovation, this playground felt dark and dismal. Now it’s open, airy and full of fun structures for kids of all ages. 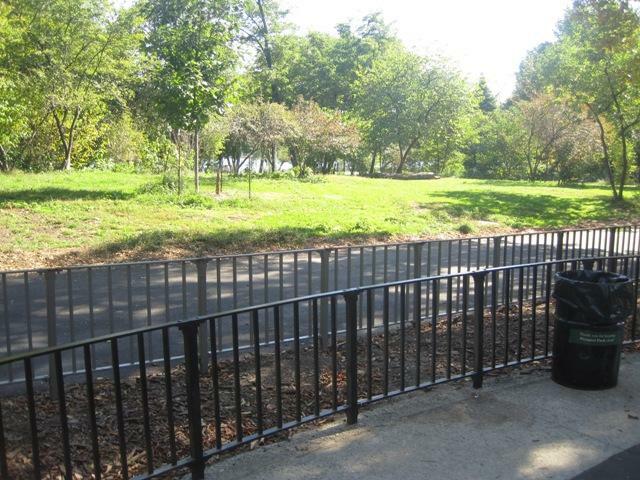 Near Prospect Park Lake, it also offers pretty views, plus Uncle Louie G’s and a decent pizzeria are across the street. For toddlers, there’s a small, gated area that’s a nice distance from the structures where older kids play. It has a small slide, steering wheels, noise-making objects, a group of round seats for sitting or balancing, and some wooden seating areas that resemble mini stages. There’s also an interesting winding water sculpture. As tall as an average toddler, it will allow little ones to stand and watch as water flows from the top and winds its way down and around to the ground. Unfortunately, the gate in this area is also very low to the ground and fairly easy for a 2 or 3-year old to unlock (and sneak out). Baby swings are nearby in another area, but surprisingly, there aren’t any big kid swings. Near the swings is the main water area. It includes a group of metal arches next to a smaller sculpture which kids have been using to push cars/trains/chestnuts on while the weather is cool (and the water is off). There is also a water canal that runs from this area to another part of the playground. It will be very fun to see once the water is turned on, but right now, it’s a safety issue for little ones: If they don’t look where they’re going as they run from one end of the playground to the other, they could easily trip and fall. For older kids, the opposite end of the playground features a huge star-shaped rope-climbing structure that seems to shoot in the sky and has been packed ever since the playground opened. There are also two spinning structures. The larger one seems to attract bigger kids who spin around very quickly (and throw up on occasion!). The smaller spinner is better for little kids. 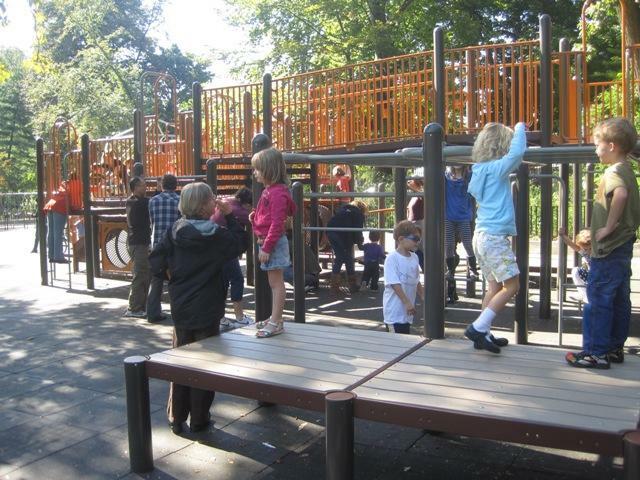 At the end of the playground is a big jungle gym that has tunnels, slides, monkey bars, ropes to walk/balance on, and chain ladders for climbing. Overall, there is ample seating throughout the playground – both benches, and those wooden stage-style seating areas -- but the area near the jungle gym offers the prettiest views of the lake, especially in the late afternoon when the sun is setting. • F Train to Fort Hamilton Parkway station (@ Prospect Ave.). • B-68Bus along Coney Island Ave./Prospect Park Southwest. • From Manhattan and Brooklyn Bridges: Take Flatbush Ave. to Grand Army Plaza, Prospect Park West exit, make left on Prospect Park Southwest at Bartel- Pritchard Circle to Vanderbilt St.
• From BQE: Take BQE to Prospect Expressway, 10th Ave. exit. Make left on 11th Ave. Make right on Prospect Park Southwest to Vanderbilt St.
For other great playgrounds, check out our posts here.